It's been six months since Lenovo launched the ThinkPad Helix at CES, but during that time we've never really stopped talking about it. Every time we've reviewed a comparable product -- a small-ish PC that could be used in some sort of tablet mode -- we've returned to the Helix as a beacon of what could be in this category. All told, the Helix has had a few things potentially recommending it: it rocks the same sturdy, well-spaced keyboard you'll find on other ThinkPads and a spec list that includes NFC, a Wacom pen digitizer and a high-quality, 11.6-inch, 1080p display. 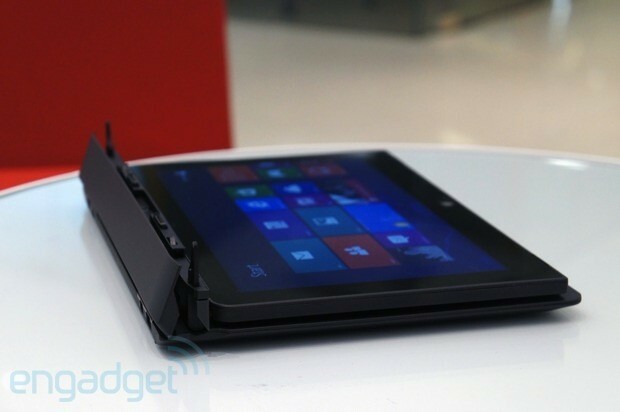 Best of all, the Helix can be used in three ways: not just in tablet mode, but with the tablet inserted either facing the user or pointed away, a design Lenovo is calling "Rip n' Flip." It's the sort of versatility we loved so much in Lenovo's Yoga line; only this is a more compact machine with a higher-res screen and pen input. Sounds lovely, right? Read on to see if it's as good in practice as it is on paper. The Helix is the most innovative Windows 8 tablet hybrid yet, with dual batteries, a bright display and a comfy keyboard to match. Still, it's expensive, especially considering it ships with last-gen CPUs. 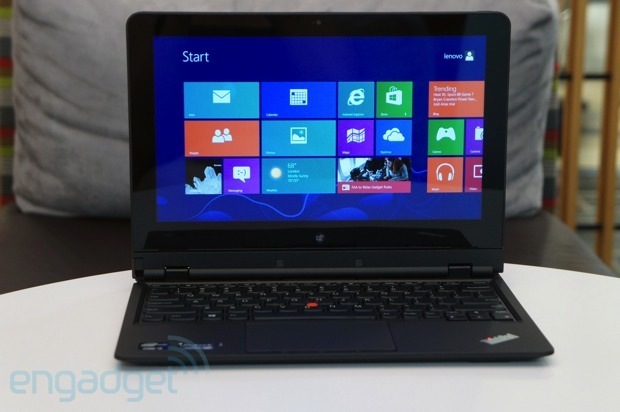 How would you rate the ThinkPad Helix? Take away the keyboard dock, and the Helix looks sort of like the ThinkPad Tablet 2, which in turn looks like any recent ThinkPad. Clearly, the company knows it has a good thing going with its design and, just as important, that its entire brand is wrapped up in soft-touch materials, red accents and sturdy keyboards. Besides, it was a really, really big deal when Lenovo revamped its touchpad layout, so it makes sense the company isn't taking chances on any other part of the design. Obviously, the main thing that makes the Helix different from the ThinkPad Tablet is that it's bigger (adding a heavy-duty Core i5 processor will do that). Also, this has an 11.6-inch screen, not a 10.1-inch one. If we're talking about just the tablet, it feels heavy, in the way most tablets above 10 inches feel sort of cumbersome. In the grand scheme of things, however, it couldn't have been much lighter: the Surface Pro, which has a 10.6-inch screen, weighs two pounds, though its smaller footprint admittedly makes it slightly easier to handle. In the strictly 11-inch category, the only lighter Core i5 tablet we can think of is the Acer Aspire P3, which weighs a similar 1.74 pounds. All of which is to say: if you've already decided you want a Windows tablet with this kind of horsepower, you've probably already come to terms with the weight tradeoffs. It's only when you connect the included keyboard dock that the Helix starts to feel heavy. The full package weighs 3.8 pounds -- nearly half a pound more than the 12-inch Dell XPS 12 convertible Ultrabook, which tops out at 3.35 pounds. Even Lenovo's own Yoga 13, which has a larger 13-inch screen, weighs just 3.3 pounds, and that, too, can be used in both laptop and tablet modes, if you recall. There are some design issues with the dock itself as well, but we'll get to those in a moment. First, taking a tour around the device, you'll find a 5MP camera around back -- strangely with no LED flash nearby. Also on back, there's a subtly drawn marking that shows where the NFC sensor is hidden. 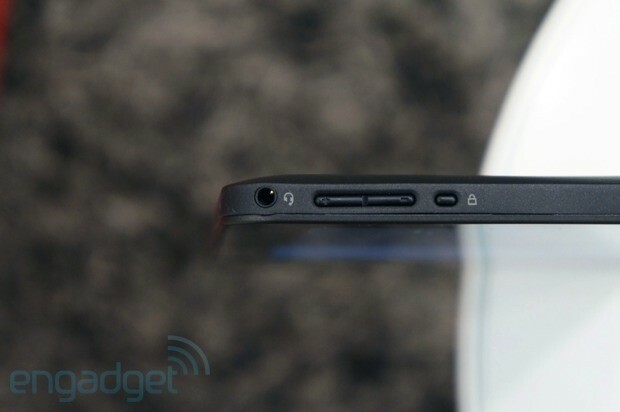 Up front, there's a lower-res 2-megapixel webcam for video chatting. Assuming you're holding this in landscape mode, that top edge is where you'll find the vent, which makes sense since it's out of the way whether you have it docked or you're cradling it in-hand. 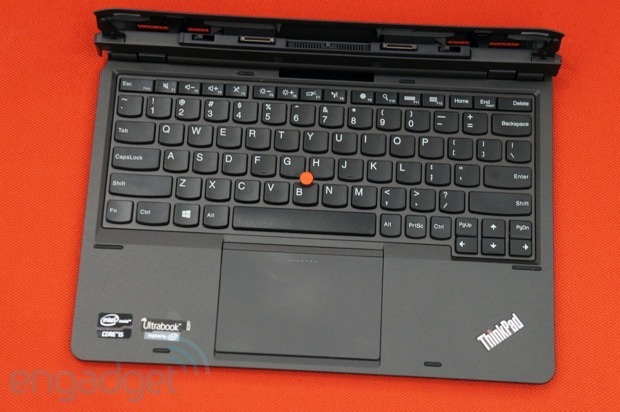 Still focusing on the top edge, you'll find a slot to stow the included pen, which, by the way, has the same red TrackPoint-inspired cap as the one on the ThinkPad Tablet. Also on top there's the all-important power / lock button, which is just recessed enough that you might find yourself using a fingernail to get at it. Over on the right are the headphone jack, Kensington lock slot and volume rocker for when you're using this in tablet mode. The left, meanwhile, is totally blank. Finally, we get to the lower landscape edge, which is where all the action is. Arranged in a neat row, from left to right, are a power connector, SIM card tray, Mini DisplayPort and a USB 2.0 socket. On the back of the keyboard dock, you get two additional USB ports, a DisplayPort and a power connection -- the same USB-like one found on the tablet itself. The problem, as we hinted earlier, is that the two pieces make for an awkward duo. First, let's start with the good. 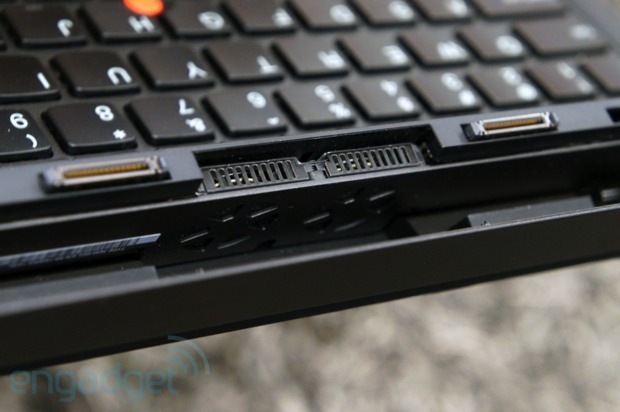 To Lenovo's credit, the tablet portion latches on sturdily, thanks to six different connecting points, including two tall, toothy guides at either end. Seriously, you could grab this thing by the lid if you wanted to (hey, it's your toy) and the keyboard would stay tightly fastened. The tablet makes a reassuring little click when you snap it in, and it's also easy to release (just press the button on the left edge of the dock, up by the hinge). And yet, attaching it in the first place can be an exercise in trial and error, as those docking guides are narrow and easy to miss when you're trying to drop the tablet in by feel. Meanwhile, because the connectors are so darn pointy, they become a liability if ever you choose to put the dock inside your bag without the tablet inside; make no mistake, things are definitely going to get caught on it. 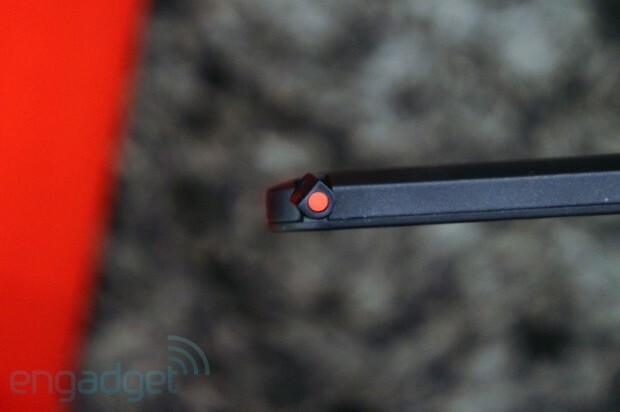 Lenovo made some other hard-to-explain design choices too. Starting with the obvious, there's a flap on the back of the hinge, covering the fan. Lenovo says the flap is there to redirect air from the fans to help cool down the machine. The thing is, the vent still gets warm, as does the entire back side of the tablet. Also, the flap is ugly, and occasionally gets in the way. (And besides, every other competing tablet gets by just fine without such a contraption hanging off the back.) In particular, if you have the tablet inserted face-out (that is, aimed away from the keyboard), the flap can actually cover the physical Start button, depending on how you angle the screen in the dock. For instance, if the screen is more or less upright, the flap is most definitely going to obscure the Start button, which is a shame since that's one scenario where you might actually use it -- it's not like it'd be convenient to reach around and tap the Start button on the keyboard instead, ya know? To get around this, you could dip the screen back at more of a 45-degree angle, with the display still facing up, but that's not ideal, especially not for things like presentations. The other bizarre thing about the dock is that unless you already have the tablet latched in, it's very difficult to push the hinge down so that it lies flat against the keyboard. You could do it that way, but you'll be met with a good deal of resistance, to the point where it might actually feel like you're about to snap off that crucial hinge piece. Take it from us: if you're going to move the hinge, put the tablet in first. Before Lenovo overhauled its laptop trackpads, it redid its keyboards. That was a big change at the time, but now it's old hat. As on other recent ThinkPads, the Helix has a six-row layout, with chiclet-style, spill-resistant keys, each of which has a roomy U-shape design that makes it easy to strike the right one without looking. At the same time, there's still plenty of space between the individual buttons and all of the major keys are still amply sized, a feat considering this is a petite 11-inch machine we're dealing with. Really, if anything's been shrunken down, it's the function keys where you can control things like volume and screen brightness. Seems like a fair trade to us. Equally important, the underlying panel is sturdy enough to stand up to even the most furious of typists. The buttons also offer a good deal of travel, especially compared to Ultrabooks and standalone keyboard docks for tablets. No, these buttons might not feel as pillowy as your old T-series notebook, but they weren't meant to either. 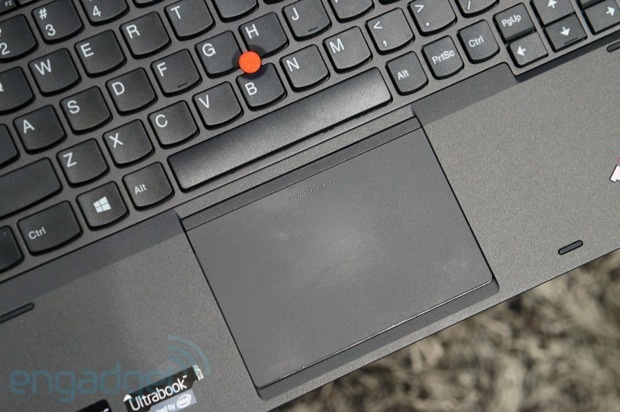 The Helix is one of the first ThinkPads to ship with Lenovo's redesigned touchpad, which ditches physical buttons in favor of a giant, flush surface with different touch zones. All told, it's 20 percent larger than previous generations, according to Lenovo, thanks to the freed-up space where the buttons used to be. Not only are there no discrete left- and right-click buttons anymore, but the ones meant to accompany the TrackPoint are also hidden. There's no scroll strip to use with the tracking stick anymore either; instead, there's just a series of raised bumps at the top of the trackpad, just below the space bar. For any of the ThinkPad fanboys who've been waiting months for the Helix to ship, this change to the touchpad will be a big one. An alarming one, even. For any of the ThinkPad fanboys who've been waiting months for the Helix to ship, this change will be a big one. An alarming one, even. Lenovo says it has a good reason: that Windows 8 laptops deserve larger trackpads for carrying out all those native touch gestures, like swiping in from the top to expose app settings. That, and there are plenty of potential ThinkPad customers who just don't "get" the idea of a TrackPoint, much less the buttons that go with it. So here we are, with a spacious touchpad that would look right at home on any other notebook, but not necessarily a ThinkPad. You can whine that it's unfamiliar, or that Lenovo possibly caved to the wrong kind of customer. You might be right. But in fact, it works just fine -- once you master the learning curve, anyway. At the very beginning of our testing period, there were a few times when I managed to hit a narrow dead zone in the middle of the trackpad, a place where neither right nor left clicks registered. With a little more hands-on time, though, that became a moot point; now, I always nail right and left clicks on my first try. Somehow, then, it's possible to re-train your fingers to hit the right places, not unlike the way you adjust to a new keyboard. Practice makes perfect, not that that makes a good marketing tagline for Lenovo. Mind you, the trackpad isn't perfect, but we're having trouble blaming it on the redesign. For instance, if you're tracking the cursor with one finger, it doesn't always go where you want it to, but that's true of many Windows laptops, regardless of who the PC maker is or who supplied the touchpad. In any event, more complex gestures like two-finger scrolling, pinch-to-zoom and all the Windows 8-specific shortcuts (swiping for the Charms Bar, etc.) work just fine. Say what you will about the funky keyboard dock and newfangled trackpad: the display is flawless. For this, its flagship Windows 8 hybrid for businesses, Lenovo chose an 11.6-inch IPS panel with 1,920 x 1,080 resolution, a digitizer for pressure-sensitive pen input and a 400-nit brightness rating. Particularly with the brightness cranked all the way up, the viewing angles are solid, both on the vertical and horizontal axes. Even in an office with both harsh overhead lighting and a good deal of natural light, the screen showed minimal reflections, despite the fact that it's not actually an anti-glare screen. Also, aside from easy readability, we found that colors and contrast stayed the same even as we viewed the screen from odd angles, perhaps with the laptop in a lap, or with the tablet off to our sides. That latter scenario was of particular importance to us, as we occasionally used the docked Helix as a sort of second screen, a place where we could browse the internet or load video without disrupting anything on our primary PC. If that setup sounds appealing to you, too, be glad you won't have to suffer any washed-out colors with the Helix sitting in your peripheral vision. The sound quality, meanwhile, is actually decent in the sense that there isn't a huge rise in distortion at higher volumes. Kanye's "I Am a God" and Eric Clapton's electric guitar didn't sound much worse at level 100 than they did at 70. Then again, the volume doesn't get very loud, though it should still be fine for a conference call in a quiet space. Failing low-noise surroundings, you could always pair it with a speaker, we suppose. As it is, the 1.8GHz Intel Core i5-3337U CPU, 4GB of RAM and Intel HD 4000 graphics help the performance keep pace with other devices in this class. We're partly referring to benchmark scores, yes, though the Toshiba-made SSD also delivers fast read speeds of 553 MB/s, with almost equally fast write speeds of 501 MB/s. In general, we had no problem juggling different apps, even after we lost count of how many we had open. As always, too, browsing in Internet Explorer felt fast with little to no tiling. Our main concern is with the startup time: it routinely took us 20 seconds or so to boot into the Start Screen. Heck, it takes about four seconds just for the Lenovo logo to appear onscreen early in the boot process. When you spend nearly $1,700 on a PC -- a business PC, at that -- you don't expect to be greeted by much bloatware when you boot the thing up for the first time. Fortunately, Lenovo mostly makes good on that promise. All we have here is Skitch, Evernote, Kindle, AccuWeather, the music-streaming service Rara.com and Lenovo Support. There's also Lenovo Companion, but we recommend you not click on it. 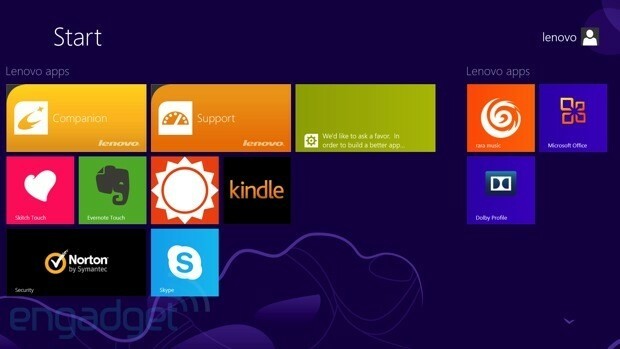 Maybe even remove the tile from your Start Screen. What it is, basically, is a portal with shortcuts for Lenovo's blogs and its YouTube channel. You'll also find offers for things like Zinio's magazine store and Norton Internet Security. Sort of a waste of space if you ask us. All of the various Helix configurations come standard with one year of coverage, though extended warranties as long as five years are available too. The Helix technically starts at $1,749; though as of this writing Lenovo's US site is offering a promotion that brings the entry price down to $1,574. That comes with a Core i5 processor, though a different one than what's in our unit: an i5-3427U, with a base clock speed of 1.8GHz. Other specs include 4GB of RAM and a 128GB SSD. Go a step up, and you get the same specs, just with mobile broadband built in. That brings the price to $1,869 (excluding any promotions that happen to be going on). Finally, going with a Core i7-367U processor also means you get twice the RAM (8GB) so that's something to consider when choosing which one to buy. Those also have a 180GB SSD, not a 128GB one. These Core i7 models start at $2,069 (or $2,249 with broadband). Again, those prices don't include any promotions Lenovo might happen to be running. The Helix falls into a growing category of 11-inch touchscreen PCs that either have a detachable tablet or can be used in some sort of tablet mode. Now that Build has come and gone without any new Surface announcements, we're inclined to believe the existing Surface Pro will stick around for at least a little while longer. Like the Helix, that ships with an Ivy Bridge processor and rocks a similarly sized (10.6-inch) 1080p display with a Wacom digitizer for pen input. As we've established, the battery life there isn't as good as on the Helix, and you don't even have the option of a dock with a second battery built in. The Touch and Type Cover keyboards do contribute to a lighter total weight, but they aren't as comfortable as the Helix's keyboard. Neither of those has a satisfactory touchpad, but then again, nor does the Helix, so they're even in that respect. 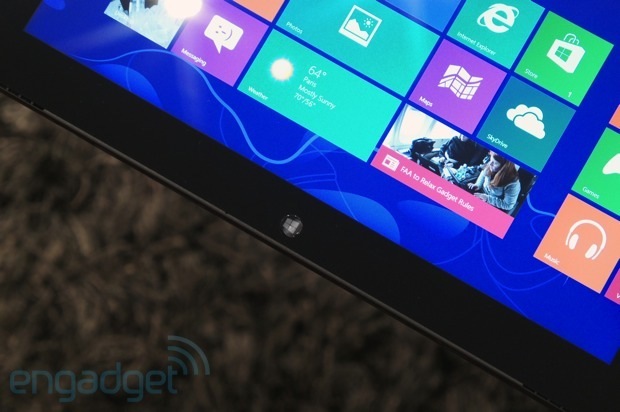 There is one way in which the Surface Pro wins, though, and that's price: the 128GB version costs $999. 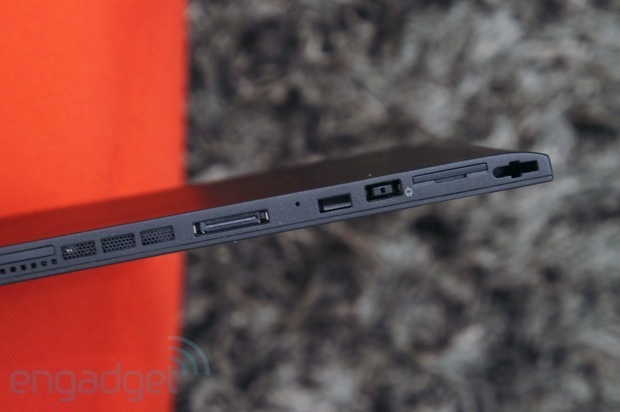 In Lenovo's own camp, there's the Yoga 11S, which is essentially a smaller version of the Yoga 13. 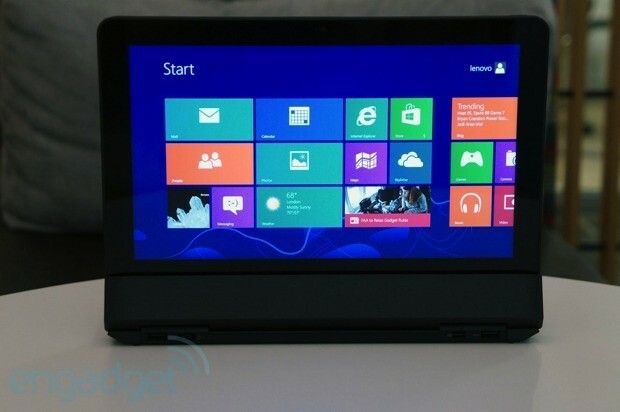 (Don't confuse this with the Yoga 11, which has an ARM processor and runs Windows RT, not full Windows 8.) We haven't tested this guy yet, so we unfortunately can't vouch for things like performance or battery life. What we can say definitively is that it's cheaper ($999 with a Core i5 CPU and a 128GB solid-state drive), but that the specs are also inferior (1,366 x 768 display, no pen input). Just in terms of form factor, it accomplishes many of the same things as the Helix, but it's clearly a consumer device, not a business machine. "Innovative" is something of a backhanded compliment, at least in this case where the design is somewhat awkward. When it comes out later this year, Dell's XPS 11 hybrid will be very similar to the Yoga 11S, and should compete against the Helix too, with a thin, light design and 11-inch, 2,560 x 1,440 display. Until it comes out, though, the closest thing Dell has to offer is the XPS 12, which recently got refreshed with Haswell -- something the Helix doesn't have yet. It's a bit heavier, even when you factor in the Helix's keyboard, and Lenovo's machine is definitely more comfortable to use as a tablet. But the XPS 12 has a comfortable keyboard and a reliable trackpad, to boot. So it really depends on whether you need a laptop first and a tablet second, or vice versa. There's also the ASUS TAICHI 21, which has dual 1080p screens -- one on the lid of the laptop and one on the inside, above the keyboard, where you'd expect it to be. But with Ivy Bridge processors, the battery life is pretty terrible, and the interior screen doesn't even support touch. You might have been considering this one, but we'd suggest you skip it; the Lenovo Helix and Yoga both accomplish the whole screen-on-the-outside thing to much better effect. Now that we've breezed through all the major 11-inch hybrids, we'd ask you to at least consider something with a more traditional form factor -- i.e., a laptop with a touchscreen. On that front, we're fond of Sony's VAIO Pro 11, which offers fast performance and impressive battery life, both thanks to Haswell. It also packs NFC and a 1080p display, along with a sheet battery option and lightweight carbon fiber design -- all for a reasonable starting price of $1,150. The keyboard isn't as comfy as the Helix's, though the trackpad is about on par. Even six months after it was originally announced, the ThinkPad Helix is the most innovative Windows 8 tablet hybrid we can think of. In a way, though, "innovative" is a backhanded compliment, at least in this case where the design is somewhat awkward. As it happens, we enjoy being able to flip the tablet portion over and have the display facing outwards for presentations and such. But the Dell XPS 12 and Lenovo's own Yoga line can do that too, and without a complicated hinge that's difficult to move and likely to cause tangles in your bag. (Don't even get us started on the Helix's bizarre cooling flap.) Moreover, when you use this as a full-fledged laptop, it's actually heavier than competing PCs, even those with larger screens. So consider how often you'll really use this in tablet mode, and then proceed accordingly. As much as we might mock the Helix's "Rip n' Flip" design, though, this product actually still has several things going for it: a sturdy keyboard, reliable trackpad and a bright 1080p display with wide viewing angles. Also, it accepts pen input, which most of the other devices we've mentioned don't, save for the Surface Pro. As a standalone tablet, it weighs less than any regular touchscreen Ultrabook, and it even weighs a bit less than other Core i5 tablets, like the Surface. The battery life is impressive too, if only because Lenovo gives us two cells instead of one. So it's a good product in many ways, even if we only end up recommending it to a certain niche (read: business customers who sometimes need a true tablet with pen input -- not a laptop that can be used in a clumsy tablet mode). Even so -- and stop us if you've heard this before -- you'd be better off waiting a few months for a Haswell refresh. Battery life will be even better, and what's more, that lofty starting price will seem a little more justified.